This 8th grade boutique opened after boutiques in Geneva, Paris, New York, Boca Raton, Tokyo, Hong Kong and Beijing. 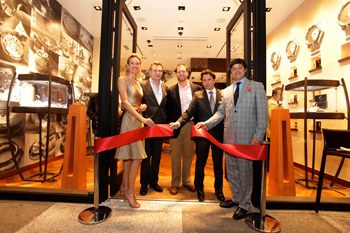 As for the design boutique, it was personally designed by Francois-Paul Journe, in full compliance with the general concept FPJourne boutiques around the world. The new boutique in the mall Bal Harbour Shops Mall in an elegant and relaxed atmosphere are unrivaled product is FPJourne. In addition to the models, there is also a lounge, bar, library hours, where connoisseurs of fine watchmaking and collectors can meet and communicate on a variety of topics.